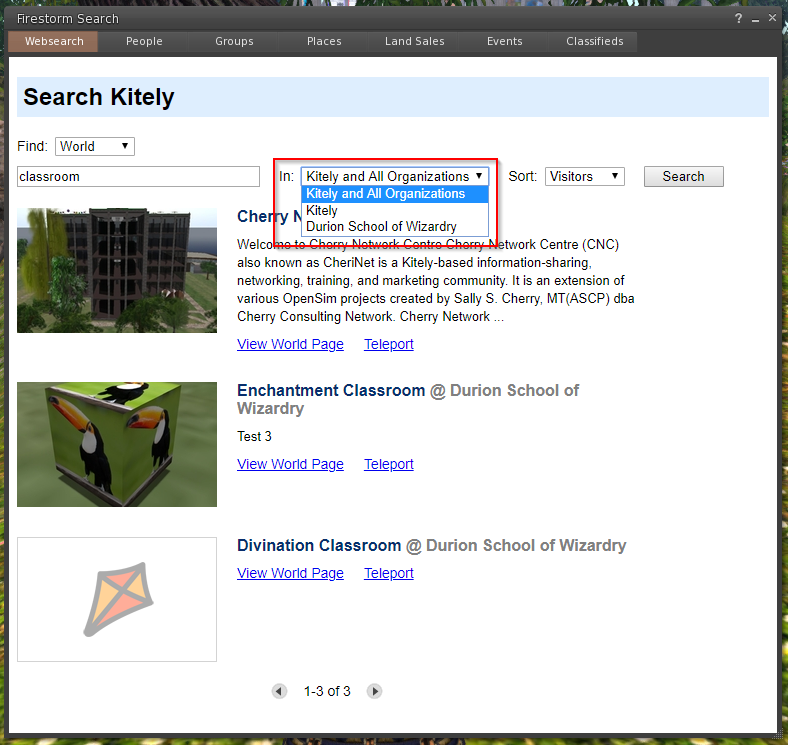 We’ve updated Kitely today with new features for searching for users and worlds. We also made improvements to the advanced permissions system in Organizations. Another option is “Kitely”. This option searches only for worlds that belong to Kitely, and excludes worlds that belong to Organizations. If you belong to any Organizations then they’ll also appear in this listbox. This lets you search only for worlds that belong to a particular Organization. In the screenshot above, the option “Durion School of Wizardry” appears because I’m a member of that Organization. In the search results, worlds that belong to an Organization have the Organization’s name appended to the world’s name. For example, see the search result “Orcs of a Feather @ Durion School of Wizardry”. Visitors – sorts worlds based on how many people are currently visiting them (the most crowded worlds appear first). Newest – sort worlds based on when they were created (the most recently created worlds appear first). 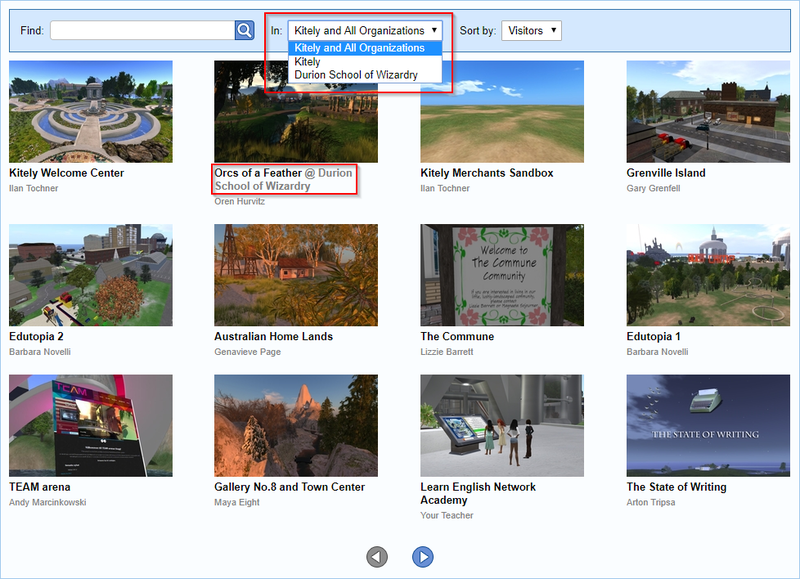 As with the “Explore Worlds” page on our website, the search window in the OpenSim Viewer (Firestorm) now also lets you search by Organization, and enables you to sort the search results. Another improvement is that the viewer search window now displays a list of worlds when you open the Search window (before you’ve even typed in a search query). This is the same behavior as in the Explore Worlds page, and it enables you to easily find new and active words. 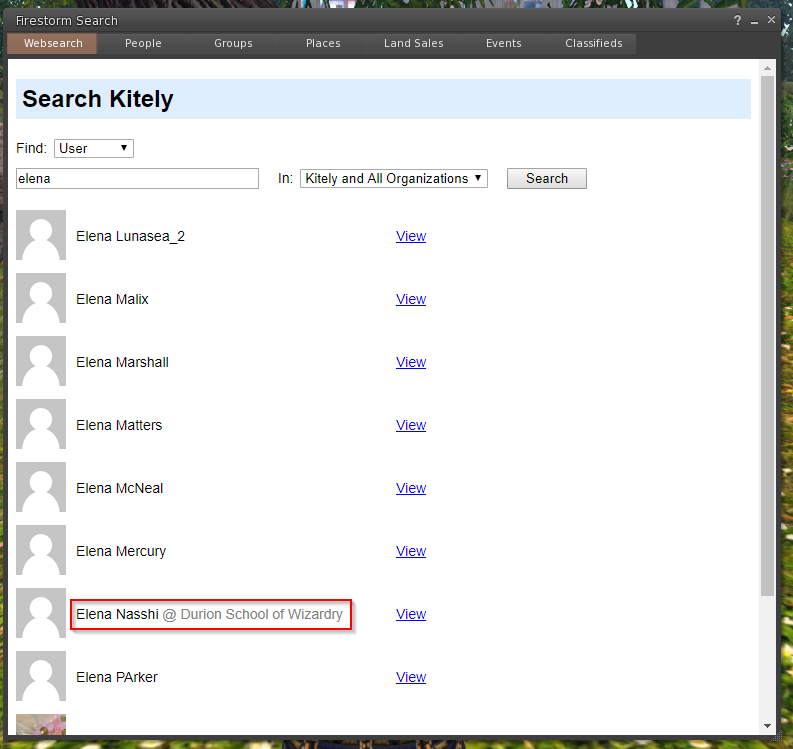 The following screenshot shows some search results, including a user that belongs to a different Organization. That user’s Organization name is displayed next to the user’s name. As with World searches, you’ll only be able to see private Organization users if you belong to that Organization. But you’ll always be able to see any public users that belong to the Organization. 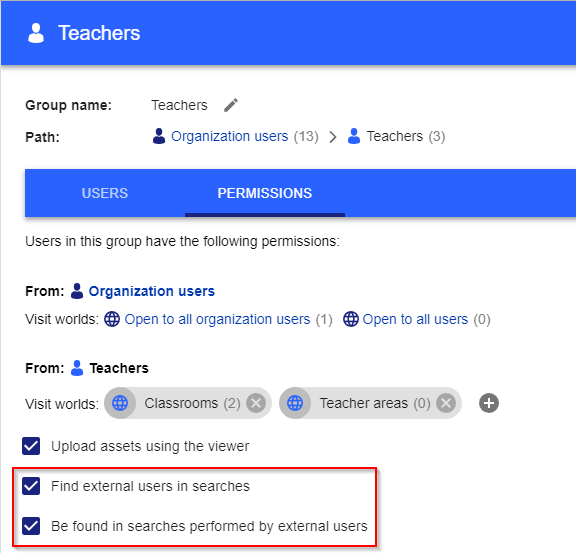 The next section explains how Organization Admins can choose whether an Organization user can be found in searches. By default, Managed Users can’t search for external users or worlds. (“External” users and worlds are users/worlds that don’t belong to the Organization). Also, by default, Managed Users can’t be found in searches performed by external users. If you are an Organization Admin then you can change these behaviors by giving additional permissions to some of the Organization’s users. The permission to search for external users is explicit: you enable or disable it by clicking on a checkbox. 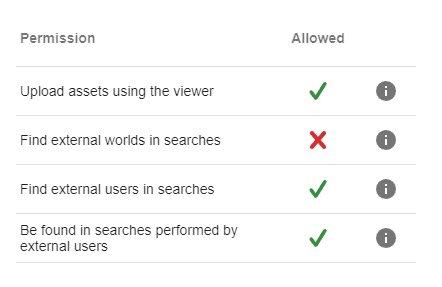 In contrast, the permission to search for external worlds is implicit: it’s automatically enabled for users that are allowed to visit Kitely worlds. There’s no explicit checkbox for this permission, because it doesn’t make sense to allow someone to search for a world but not to visit it, or vice-versa. We’ve improved the process of adding custom grids to Kitely Market. This process is used when you want to deliver products from Kitely Market to a different grid. You’ll now get better validation that the Grid URI that you’ve entered is valid and leads to an active grid, so that if there’s a problem with the grid information that you’ve entered then you’ll be notified about it faster and more clearly. We’ve improved the performance of the llListen LSL function.